Abigail dreads swimming lessons. 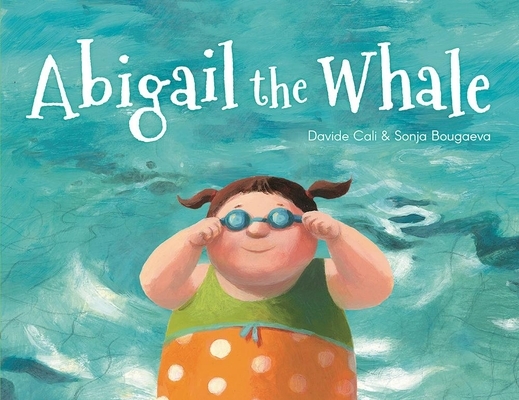 Every time she dives into the pool, she makes a big splash, and all the girls in her class shout: "Abigail's a whale " Abigail can see that she is larger than the other girls. She feels huge, heavy, and out of place. Abigail's swimming teacher takes her aside and points out: we can change how we see ourselves. He offers a creative visualization technique she can use to feel bolder, more confident, and more accepting of herself. Abigail tries it out in challenging situations that week--walking home in the dark, eating her vegetables, trying to fall asleep. Illustrations in the book show her perspective morphing powerfully to match her new thought patterns. Next time she's in swimming class, instead of feeling heavy, Abigail thinks sardine, eel, barracuda, shark She starts to figure out how to draw on mindfulness, creative thinking, resilience, and positive self-esteem to embrace exactly who she is. This picture book supports social/emotional learning and serves as a perfect jumping-off point for topics like bullying, empathy, confidence, and creative problem solving. DAVIDE CALI is a Swiss-born Italian picture book and graphic novel writer. He has written numerous books that have been published in over 25 countries. He has won numerous awards. He also has two pseudonyms: Taro Miyazawa and Daikon. He is perhaps most well known in North America for his evocative work The Enemy (illustrated by Serge Bloch). SONJA BOUGAEVA was born in St. Petersburg and now lives in Hamburg, Germany. She studied book art and painting; she also trained as an animator and worked in a film studio.